The last time we looked in on Donny Little-Hands (the clown masquerading as our president), he was pardoning a convicted racist when Hurricane Harvey hit. Since then he's visited Texas to see how bad things were on the ground after Harvey's devastation. In true Trump fashion he turned that event into a farce - gleefully noting all the people that came to see him. Oh yea. There weren't any signs of devastation where Rump's press conference was held. And he didn't explore any further with officials. The next day he bragged to reporters how he saw the devastation up close. Our Liar-In-Chief has entered into the valley of investigations and into a Temple of Doom of his own making. Obstruction of justice. That's the sign above the door of the Temple. Stump entered months ago. His greeter was special counsel Robert Mueller who's leading an investigation into ties between his campaign and Russia. Apparently the investigation is heating up in the Temple. News reports stating that Trump signed a deal for building a Trump Tower in Moscow - during the campaign - have emerged. 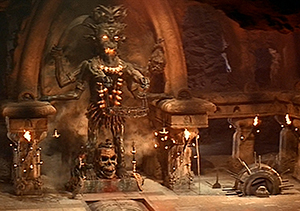 Financial ties are also among the obstacles Hump must navigate in the Temple of Doom. Unlike the movie, where the hero gets out of the deadly Temple, Donnie isn't going to be so lucky.